I cannot believe there's another hurricane headed for Florida. It's just mind-boggling. I'd be ready to flee at this point. We're so lucky we haven't had anything more than heavy rain here. It's unnerving, though. I spent a good part of the evening working on the music from Tapestry, which Sue and I will be interpreting this Thursday evening at Smithtown Center for the Performing Arts. (631-724-3700 for tickets and information) It's a very entertaining show with wonderful performers. Come on down and see us. I don't expect a large deaf audience for this since it's a revue rather than a play. I need some sleep! Have a good evening. Still waiting for the falling leaves. It's funny but every year, I become so preoccupied with life in general that I tend to notice the fallen leaves all at once, usually while driving down the street. It's a sudden revelation that there are leaves all over the place! Someday, when I'm retired, I'd love to do one of those beautiful fall walking tours. I'd also love to visit Florida at sometime other than the heat of the summer! Once autumn arrives, it seems like we just turn around and the holidays are here. Cooler weather is welcome, although I'm not at all happy when it's cold. Every year, it seems colder. It's not the weather, it's me. As I do every year, I attended the flea market today. Always a fun experience, although I miss the days when I ran into so many people I knew. I walked around for a couple of hours, bought a few things and had a nice lunch from the Beauty and the Beast table. They have the best food. I've always said I should take a picture of this but was never sure how it would come out. Not bad, actually. This is the wall in the "alley" where you come out of the Marriott Marquis hotel, right near Shubert Alley. The guy leaping on the right in this picture is none other than Harvey Evans. The picture is from the original production of West Side Story. It was so chilly today! I thought it would warm up, at least into the 70's. If that happened, I didn't feel it. I dressed for warmer weather and was cold, especially since there wasn't much sun on the flea market. I don't think I was the only one. It was a beautiful day, though, and we're lucky the weather wasn't as nasty as it was yesterday. I saw an intriguing article in the Daily News today about a cute website called Who is that with Jeremy? It's done by a Dad who takes photos of his baby son with celebrities. Very cute! The four day weekend is over. Ah, well. Back to work tomorrow. Today is the anniversary of the Civil War battle of Antietam, the bloodiest day in American history. This battle, while devastating to both armies, was the scant victory Lincoln was waiting for to issue the Emancipation Proclamation, which had been written the previous June. Brief information here at history channel.com. Kelly and I visited the battle site and had some eerie experiences. We both heard sounds in the same place, she heard gunshots and I heard a snare drum beating. We discovered later that others have had similar experiences. The bridge in the picture on the first webpage is Burnside Bridge. After only three days last week, we also had a three day week this week. Yesterday and today, school's closed because of the Jewish holiday. I can still keep myself busy! Next week will be our first full week of work and I think we'll all be in shock. The students won't be far behind us! Let the complaining begin! School is back in session and it's amazing how tired I can be at the end of the first few days. Just getting back into the swing of things, waking up earlier and all, is difficult after having so much free time for two months. Once I get used to it, I won't be so worn out but as it is, I get home and need some down time before beginning dinner and then I'm fine, I get a second wind for the evening. The new job is fine, love the hours! I have to be there 7:30 and it takes me, no joke, no more than five minutes to get there. Whoo hoo! I've never worked anywhere that close, ever. Of course, I travel from the high school to tech and that's twenty minutes away but still, I don't have to leave so early in the morning to make it to work on time. I'm loving that. I'm home by 3:10 and that's a huge improvement over last year's September schedule. Ok, advertisement over. We now return you to our regularly scheduled journal. Billy is in Minnesota. Why, you ask? For the World Cup of Hockey. I believe he's seeing a semi-final game, in which USA is playing Finland. Having just checked the web, it appears USA was knocked out by the Finland team. That's disappointing. Poor Bill. Well, at least he was able to see them play. He was afraid that USA would lose to Russia and he wouldn't see the team, so I guess he'll at least be glad he saw them play. He'll be home tomorrow afternoon. Pooh's working already, looking quite industrious. The leaves aren't even off the trees yet! As you can see, I had a bit of trouble finding a Pooh graphic for Labor Day. Not one of the big clipart holidays, I guess. For those of us who work in schools, Labor Day is a "non-holiday". It signals the end of summer and the beginning of another year working. So, it's not that big a deal. For the rest of the workforce, it's a day off. Kelly and I are going to the Labor Day gathering given by her employers. Everyone who has worked with them in the past season (and seasons before) is invited so this year, as a former employee, I will attend. I still have tomorrow off and school begins Wednesday. However, three days this week will be followed by three days next week since schools are closed Thursday and Friday of next week for Rosh Hashana. So, I really shouldn't complain! I've done more work on that baby sweater for the Knitware program. I don't know why I decided to use a size 2 needle but I must say, it does look really nice. It shouldn't take too long (famous last words!). Although it doesn't look much like this yet, we know it's just around the corner. 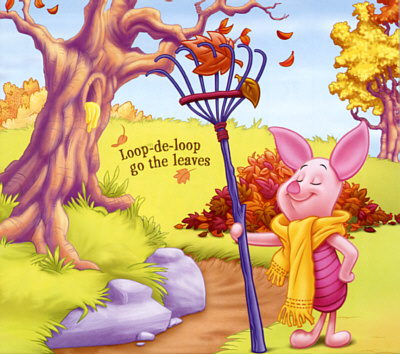 I don't think I'll have the smile on my face that Roo has when it's time to rake those leaves! Ah well, the seasons change! Not much to say today. I just wanted to get the month started here before school starts and things get busier, if they can be any busier than my summer has been. It's strange having two months off in the summer. Don't get me wrong. I love the break, it's great. It just makes it a bit of a struggle to begin the new school year. I get used to sleeping later in the morning, although my sleeping late means about 7 or 8:00am, and having the time to do what I'd like to do. The good thing about this school year, as opposed to last year at this time, is that my day begins early and ends early. No more late afternoons on the football field. That's a very good thing. Take care, all, and ttfn!